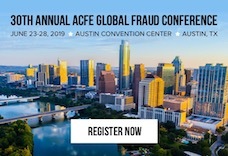 ACFE President and CEO Bruce Dorris, J.D., CFE, CPA, opened the 29th Annual ACFE Global Fraud Conference on Monday and highlighted three trends anti-fraud professionals can expect to see over the next few years: the increased usage of blockchain technology, the necessity of using data analytics and the importance of collaboration. Earlier this year I read a short article in Barron’s about why we should all care about Tim Duncan’s fraud case. I know I care because I am a devout San Antonio Spurs fan and love Timmy about as much as I love Pete Sampras. Which, trust me, is a lot. The fraud may not have even been discovered if not for Duncan's divorce in 2013. During Tuesday morning's General Session, Eugene Soltes broke down the psychology of white-collar criminals. "The victims in most frauds are both psychologically and physically distant," he said.